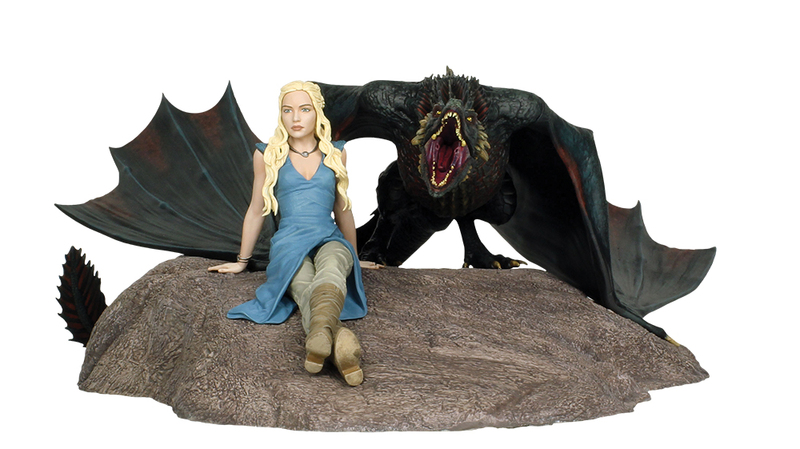 Daenerys & Drogon Statues Premiers at Toy Fair 2015! Dark Horse is kicking things off for Toy Fair with the reveal of the latest release in its growing line of figures based on characters from the smash-hit HBO series Game of Thrones®! Daenerys Targaryen, the last noble of her house, is on a path to reclaim her destiny in Game of Thrones. She has emerged as one of the series’ best-loved characters.Dark Horse Deluxe has focused on an iconic moment of Daenerys and her dragon, Drogon, to create an elaborately detailed pre-painted limited-edition statue measuring 14” across and 18” from front to back. The prototype will be revealed at the Dark Horse booth #4837 at Toy Fair 2015, held February 14-17 at Jacob Javits Center in New York City. The limited-edition quantity is still to be determined as of press time. Daenerys & Drogon will be packaged in full color oversize collector box. Release date is estimated summer 2015. Suggested retail price is $424.99.